I am 1.80 meter tall and weight 62kg (so tall and thin), am 50 yo and am from Belgium. First, when you want to do boho chic, it is important never to forget the “chic”. So do not overload with hippie looking items. You do not want to look like Esmeralda. 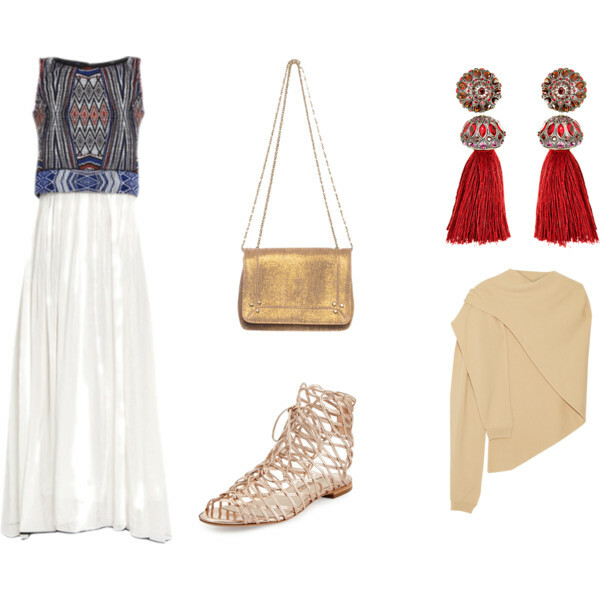 Most of times, only one statement boho or ethnic piece is enough, or even only accessories. With its modern tribal looking print and its fluid yet narrow shape this skirt is boho yet not Esmeralda looking. Perfect for a tall lady like you! I paired it with a simple top in raw looking silk, leather knotted sandals, a rope looking bracelet and totem like earrings. The blazers adds something chic to the mix. This indian jacket is the statement piece of this outfit. The pants, top and clutch are chic basics that perfectly match the colors of the jacket. You can start from a neutral basis in natural colors before giving the boho attitude with accessories only. Here I picked high waisted mustard colors wide pants and a cream blouse. Perfect for your silhouette. I then pimped them with: an indian looking belt, hand-manufactured gold graphic necklace, tattoo like sandals with tassels, african looking seed bracelets and a graphic inca print (ok, ok ^^) clutch. This Ikat dress really makes a statement. For the rest, I remained low profile with rope like sandals, a polished gold purse and a shawl. The tassel earrings match the print of the dress and bring a pop of color to the face. The layering of fluid pieces feels bohemian. Especially if you choose nature inspired colors and natural fabrics. Like this emerald stone colored tunic. I then completed with nature inspired earrings (raw stones) and bracelet (animal shaped) and a hippie chic pouch. Hope I inspired you to be the boho chic godmother ! I really love the top and bracelet in the first outfit and the top and necklace in the second outfit. I would love to be able to wear these to a wedding soon!